Hotel Zenit Borrell, Barcelona. Zenit Borrell Hotel Barcelona. Located in the heart of Barcelona 's financial district, close to the train and metro station, the Hotel Zenit Borrell is ideal for business guests as well as tourists who wish to discover this exciting city. 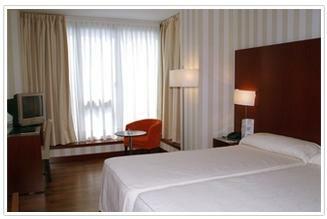 Guests will be not far from the congress centre, the popular Plaça Catalunya and the Ramblas. The Zenit Borrell has 74 stylish and comfortable rooms designed with great attention to detail to assure our guests' comfort. All rooms are soundproofed as well as air conditioned and are equipped with all modern services, including a full bathroom. We invite guests to enjoy a meal at the hotel's Marés Restaurant, which offers a wonderful menu of traditional dishes prepared with a contemporary twist, in a stylish and comfortable atmosphere. The hotel has four meeting rooms, equipped with the latest technological equipment, and capable of hosting a diversity of events for up to 50 people. The friendly staff at the Hotel Zenit Borrell will warmly receive guests and assist you throughout your stay in Barcelona.